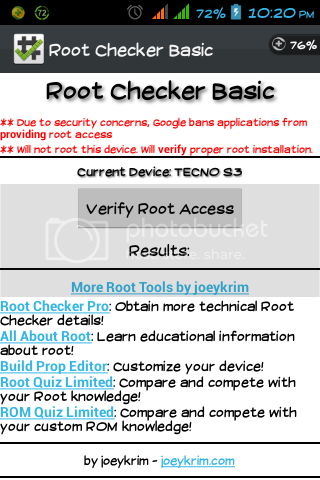 Good day to you, I know you would have been hearing about rooting of android devices now you are here to know how to root your device. Android rooting is the process of allowing users of smartphones, tablet and other device running android system to attain privileged control (known as root access) within Androids subsystem. – Download and install FRAMEAROOT here. Launch after installation. – Choose Install Superuser and click on “Boromir” or any other text displayed at the bottom of the screen (the text vary because of the android manufacturers). – Now a message would popup telling you success :-)…Superuser and su binary installed. You have to reboot your device. If superuser fail to give you success you can choose supersu instead of superuser. 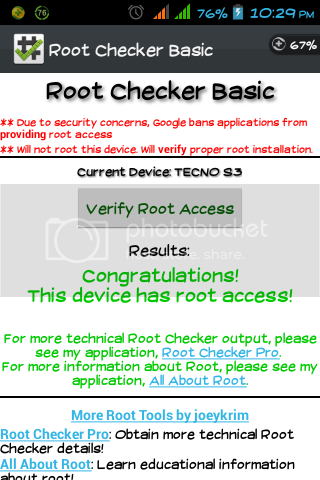 – Click on verify root access, grant the root process and you would see a congratulation message that your phone has root access as shown below. If otherwise restart the procedure from step one.